Crafting is a game mechanic that allows the player to create new items from a specific combination of existing items. One of the most unique things about Vintage Story is the number of different crafting methods available to the player. 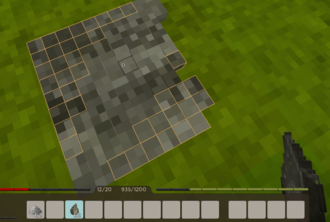 Grid based crafting is available at the beginning of the game by pressing the 'E' key and laying out items in a specific pattern in the grid on the right side of the screen. A full list of grid crafting recipes can be found here: Crafting Recipes. Knapping is pretty simple, just take two pieces of either flint or rock and hold left Shift to sneak and right click on a solid block. This opens a small dialog where you can select what you want to craft. Use the second flint or rock, to chip away all voxels marked in orange. Don't worry about making mistakes, the game prevents you from breaking the parts you need. Alloy crafting involves smelting metal down to a liquid form, and then combining it in such a way to form new metals. Copper and bronze can be cast into ingot or tool molds to make items. Many other metals (such as lead) can be cast into ingot molds. This page was last modified on 28 February 2018, at 09:14.